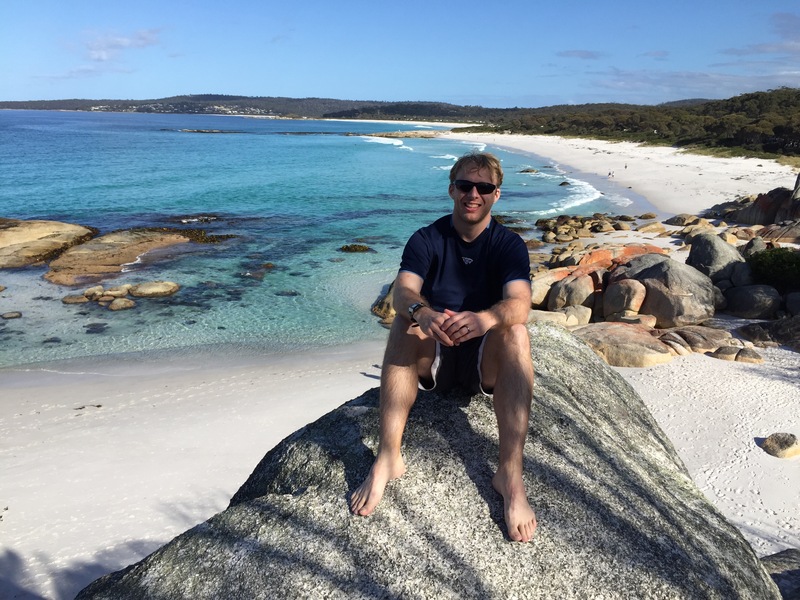 Today was a travel day from Ayer’s Rock to Hobart, Tasmania, with a short layover in Melbourne. Besides my second flight getting delayed, a boring day. I made it to my lodging in Hobart and called it a night, since I had to be up early to head to Port Arthur. After checking out, at 8:30am my shuttle picked me up and we headed for Port Arthur, with a few scenic stops for pictures along the way. 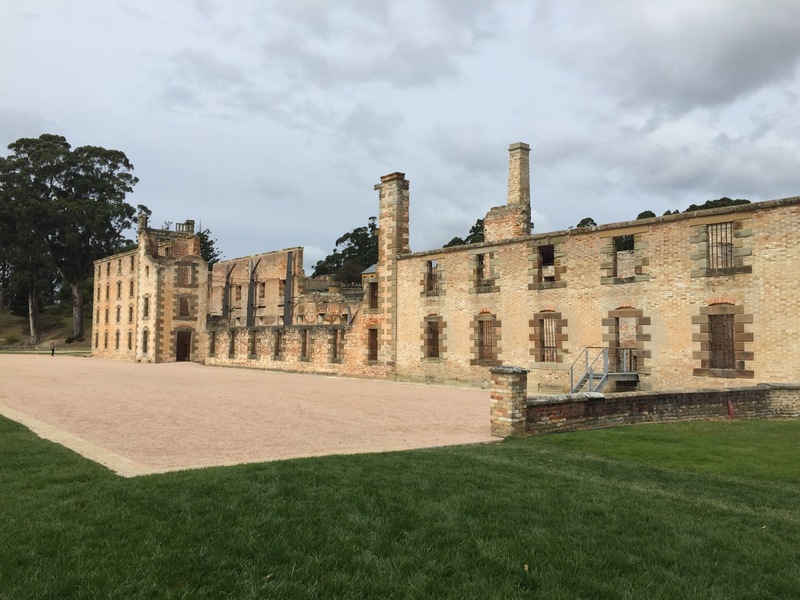 We had about 4 hours there, which was plenty of time to grab lunch, spot 2 pademelons running around, take a harbor cruise, and explore the ruins of the prison and surrounding community there. Once that finished, it was back to Hobart via the shuttle. We made several stops on the way home. The most interesting was Abel Tasman National Park, to see the Tasman Arch. 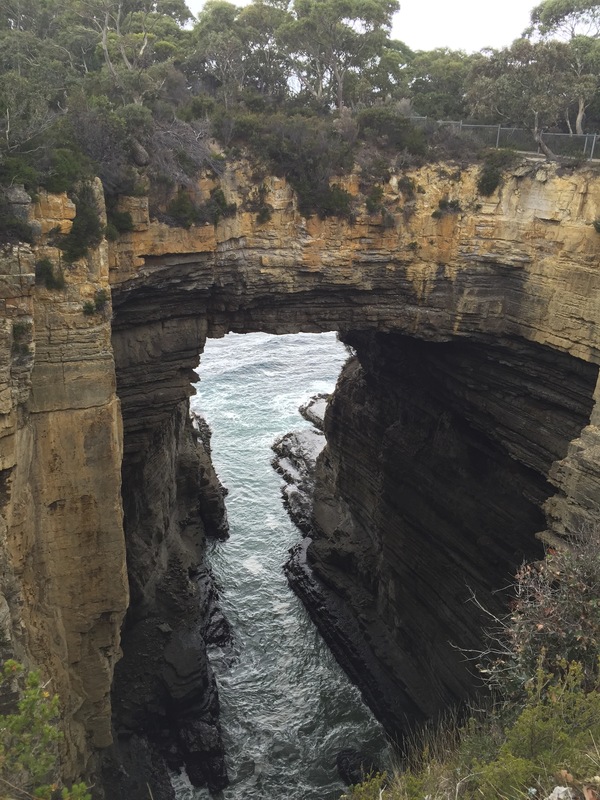 This is along the coast of the sea, and is a sea cave that collapsed, creating an arch. Next to it was a smaller sea cave known as Devil’s Kitchen. We also stopped on the way home in the small town of Richmond. Not the most interesting stop, but it did have the oldest bridge and oldest church in Tasmania. I got dropped back off at my hostel in Hobart, and got ready for my 7:30am pickup the next day. 7:30am rolled around and I got picked up by my bus for the next few days, Jump Tours. It ended up being a group of just 5, plus the guide. While the day before was technically a part of the tour, this felt like the real start, as we immediately set out to do some hiking. 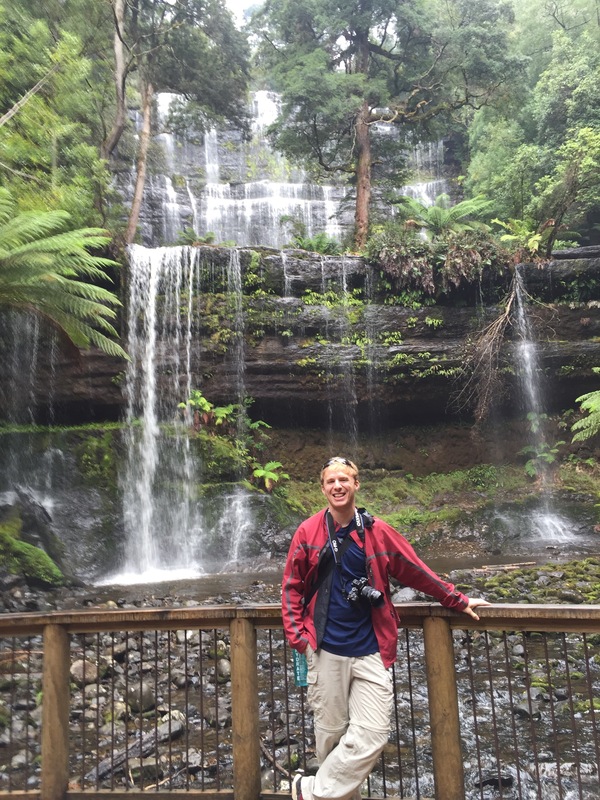 Our first stop was Mount Field National Park, and a short hike to a nice waterfall of Russell Falls. On the way we spotted a pademelon, which is similar to a wombat. As was to be the norm this trip, after the hike was a drive of an hour or more to our next stop. We passed over a scenic Meadow Lake just in time, because as soon as we got over it they had to shut down the road to allow a herd of cattle to wander across. Around lunchtime, we made it to Lake St Clair and had lunch at the lodge. 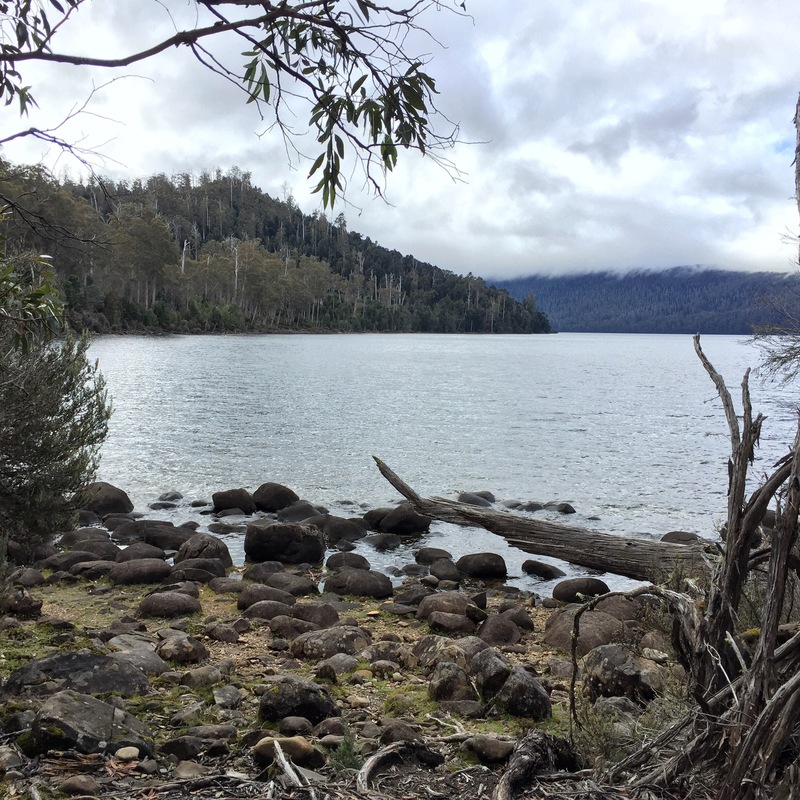 We then set out for an hour or so hike around the lake, including the loop of Platypus Walk. 0 platypus were spotted today though, but we got some nice views of the lake, even though it was raining a bit. We headed up the road a bit, stopping to see some of the hydro power stations, to Donaghy’s Hill, and hiked up. From the top, we could see the Tasmanian Wilderness Area in all directions, including the Franklin River. With all the activities done for the day, we headed to our lodge in the town of Tulluah, population 250. The company owns a house there known as the “Jump Holiday House”, or “Jump Shack”, which is just an old house across from the pub they are trying to convert to a backpackers hostel. Since we were such a small group, it wasn’t too cozy. 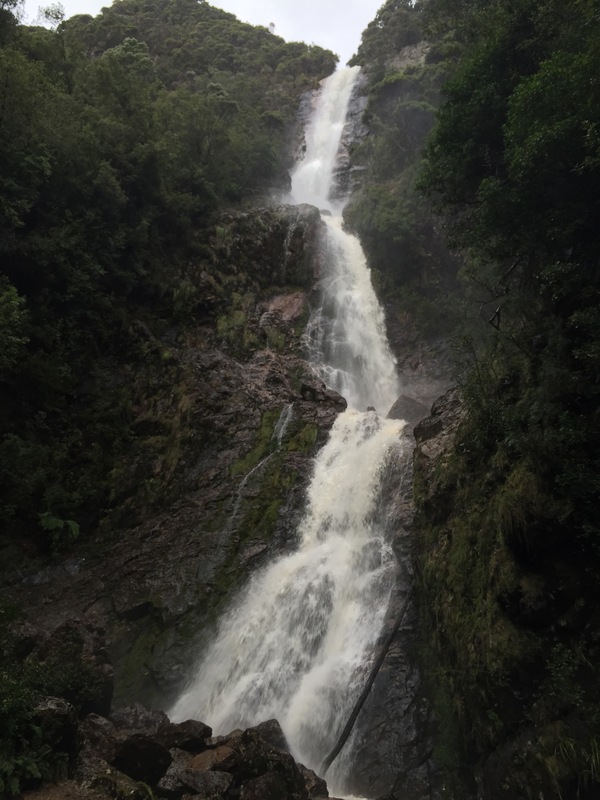 Today was our longest hike, about 3 hours through the rainforest to Montezuma Falls, which is Tasmania’s tallest waterfall. A railroad used to run here 50 years ago, but they’ve now removed most of the ties, and the old path is now the hiking trail. Given it was a former railway, the path was never too steep. As was the norm for our time in western Tasmania, it was raining. Our shoes got nice and drenched, but the tree cover gave us some shelter. In addition to the falls (~103m), there was a suspension bridge across the valley, and one of the old mines you could walk into. After finishing and laying shoes out to dry, we went to the small fishing village of Strahan for our daily lunch and wander around break. I found a place that served scallop pie, so had one of those, since it’s a very Tasmanian food, or so I was told. Another hour worth of driving in the rain later and we reached the Henty Dunes – which reach several kilometers and lead to the Southern Ocean. The rain picked up and pelted us, along with the sand, for a bit but then cleared up. 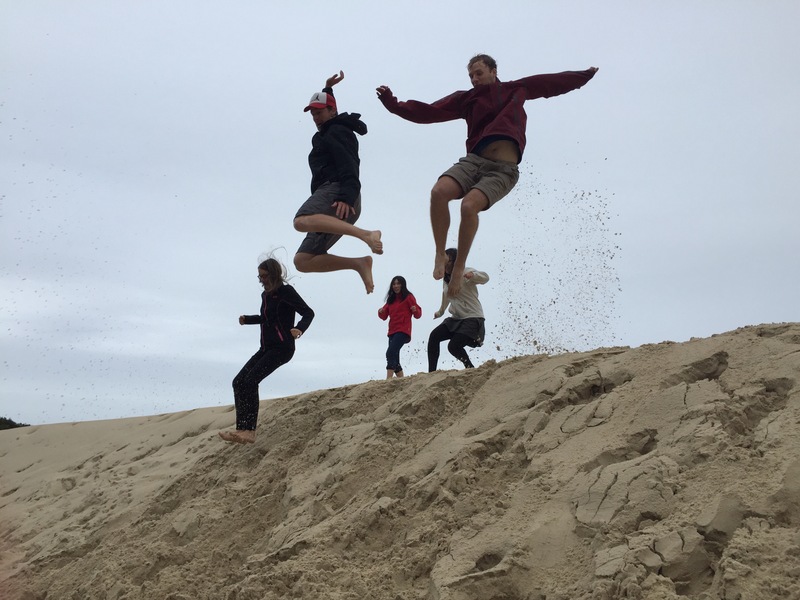 We went to one dune that was shaped correctly for some good jumping pictures, so did that for a while. Given that everyone was cold and tired at this point, we headed back to the Jump House a bit earlier today. Everyone headed to the pub for dinner, mainly since they had a fire so we could dry out our shoes. Today’s feature was Cradle Mountain National Park. We packed our stuff up from the Jump House and headed there first thing. At the entrance to the park was passed a Tasmanian Devil sanctuary, which we unfortunately did not stop at. As was expected, once we reached the park it was raining. 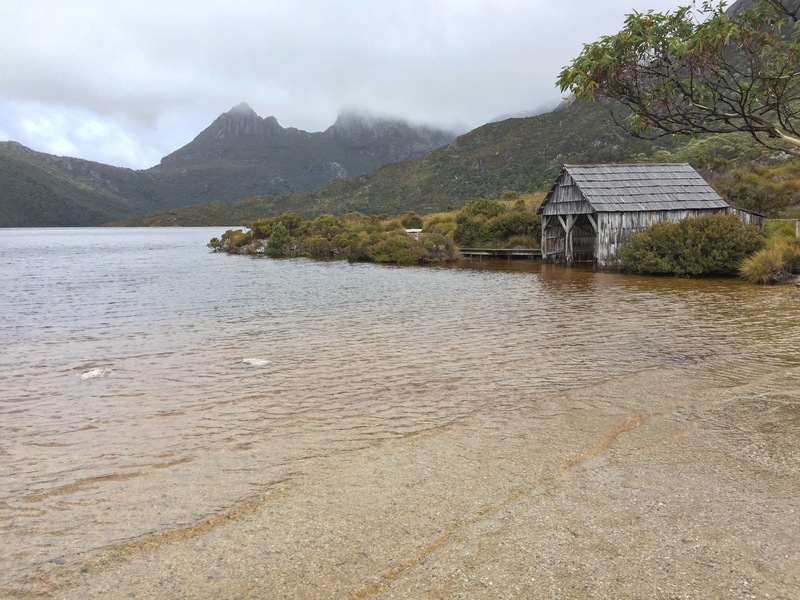 We chose to hike the Dove Lake circuit trail, which looped around the lake and had some great views of Cradle Mountain. It rained on and off the whole time, and was rather cold and windy, but it was still an enjoyable hike. It took about 2 hours to make the whole loop. Once we all dried off, we went and stopped in Sheffield (the town of murals) for lunch. The rest of the day was spent driving towards the town of Launcheston. We made several stops along the way including stops for honey tasting (over 50 different types, including some spicy ones) and for a salmon tasting as well. We arrived in Launcheston just before dusk, and got checked into the Launcheston Backpacker’s. The whole group ate together (Dominos – very Tasmanian), and we met the 4 extra people who were joining our tour the next morning. Every Saturday in Launceston is a market, so we started our day out by wandering through that a bit, grabbing breakfast there, as well as seeing the monkeys that live in the Launceston City Park. 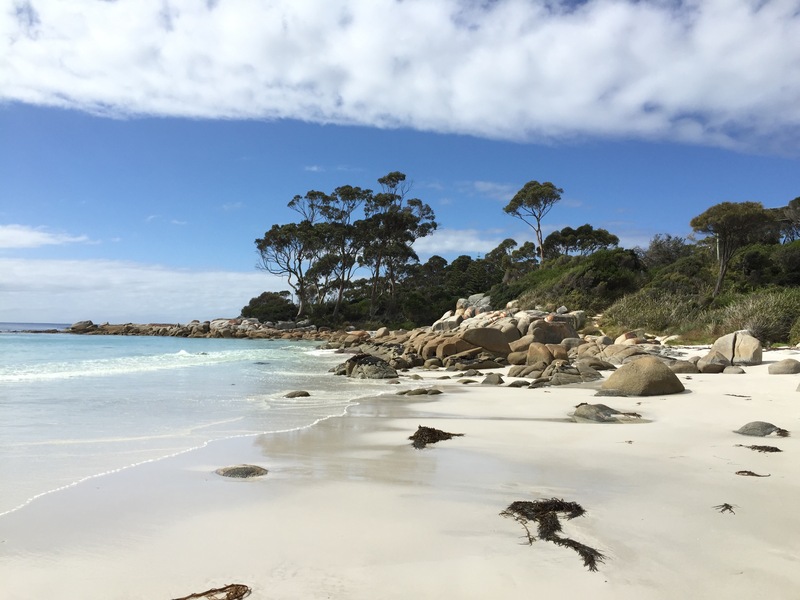 The morning was spent driving to the Bay of Fires. Along the way we made brief stops in Legerwood to see their memorial to soldiers carved into tree trunks, and a cheese tasting at Pyengana Dairy Company. Bay of Fires was time for a picnic (consisted of various things I had assembled from the past days tasting – salmon and cheese on crackers, as well as some oysters we had picked up 10 minutes before). Even though it was a bit chilly, I went for a quick swim. We then went to check out a second beach, which had a bunch of red rocks from all the lichen. Around 5pm, we started to head to our final destination for the night of Bicheno. Since it was the last night of the tour, the group decided to make dinner together and have chicken pasta at the hostel. Everyone was up by 7am the next morning to catch sunrise. The view was slightly obstructed, but still worth getting up early for. After some quick breakfast, it was off for our first stop of the day, a hike to Whaler’s Lookout. This was a 15 minute hike up the hill to some good overlooks of the bay. We were also able to spot some penguins out on one of the rocks. 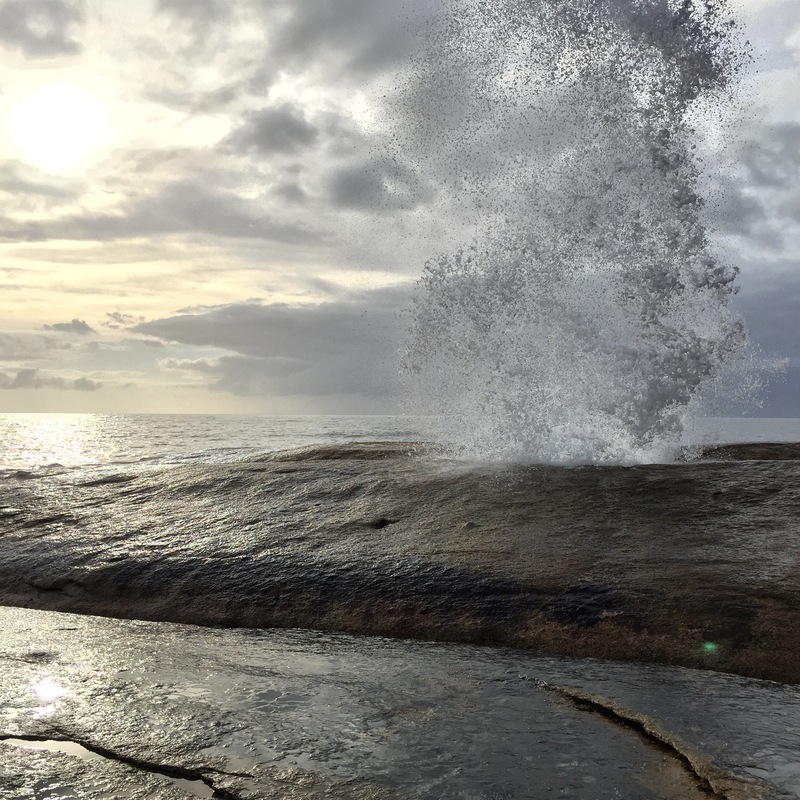 Next we headed to a blow hole a few minutes away, and there were enough waves to give us a good show. Next up was Nature World, a cross between a zoo and wildlife sanctuary. They had free range kangaroos that could be fed, along with some pademelons and wallabys you could walk among and feed. 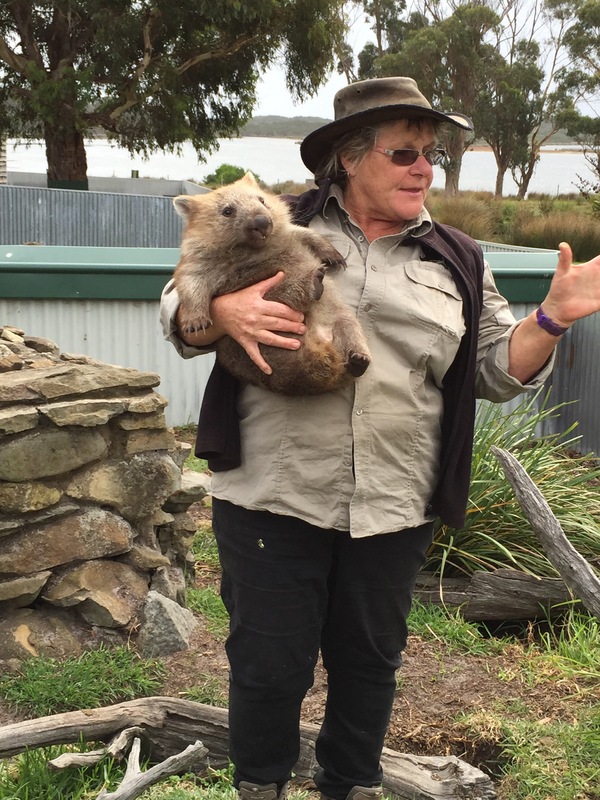 In addition, they had a wombat and Tasmanian devil feeding we got to see. 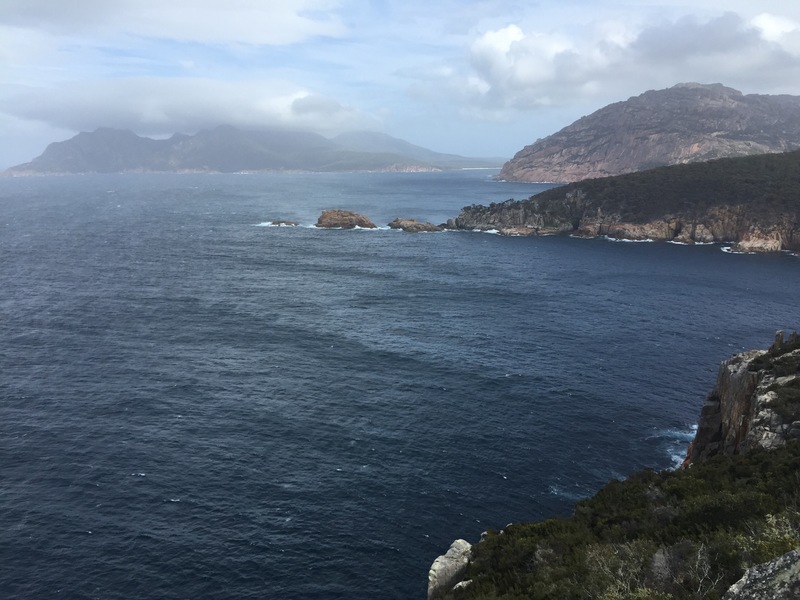 Once we left, we hit the road again and got to Wineglass Bay, in Freycinet National Park, around noon. 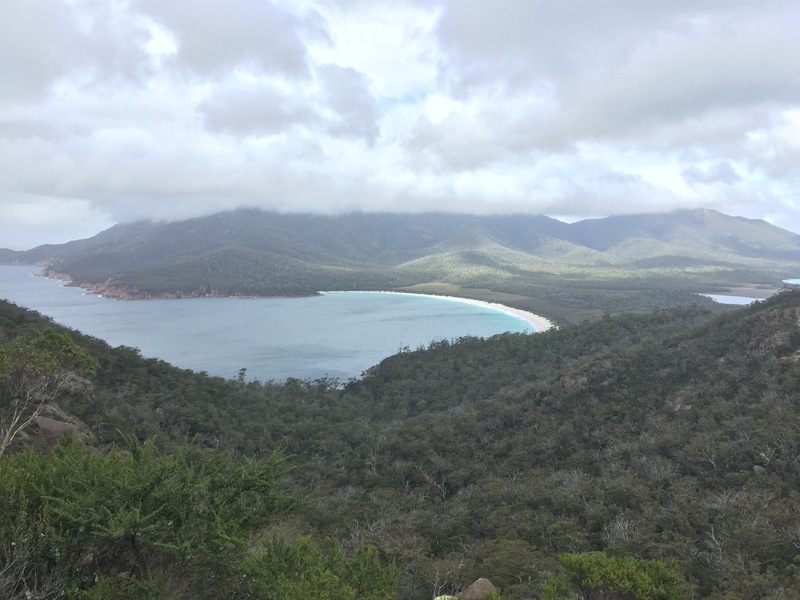 We did the 45 minute walk up to the Wineglass Bay lookout. It would have been another 1.5 hours to head down from the lookout to the beach, so the group decided to head back to the car and go to a closer beach instead. The chosen beach ended up being Honeymoon Bay, where we also stopped to have our lunch under some picnic table, since it was lightly raining. The rain let up, and we went to wander the beach a bit. The wind had picked up and it was quite overcast , so no one went for a swim, since it was a bit cooler than the day before. On the way out of the park, we stopped and did one more short (15 minute) hike along some sea-side cliffs up and around the lighthouse at Cape Tourville. At this point, our tour was basically over so we started the drive back to Hobart. We made two stops along the way – one at Milton Vineyard for a wine tasting (the winner was a iced Riesling) and then at Kate’s Berry Farm to try some jams, and order some ice cream for an afternoon snack. We made one or two more stops for pictures, but we soon hit Hobart around dusk and got dropped off at our lodgings. We all met up again for one last dinner in the city at The Shamrock Hotel.